MAGUISA has state-of-the-art technologies that allow it at all times to be a leader in competitiveness and productivity in all markets, as well as facilitating an unbeatable service providing. Quality is the benchmark of the company and all the activity is aimed at making it always superior. 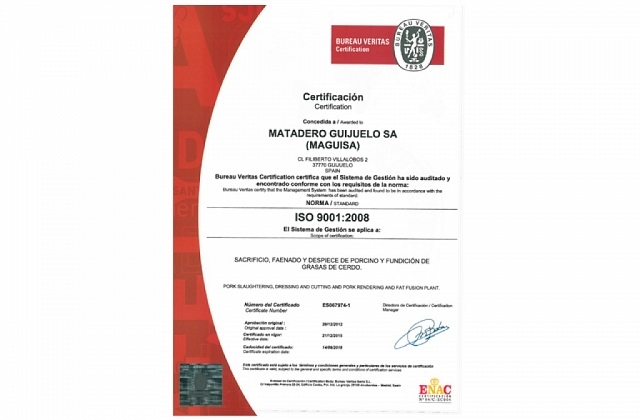 According to this premise, MAGUISA perfectly meets the sanitary standards of food safety and environmental respect. Today, it slaughters 360 Iberian pigs per hour, with a quartering capacity of 180 pigs per hour. And daily, it transforms all the pork by-products that it generates, so that the process is clean and complete. All this is possible thanks to not only our team that works tirelessly to comply with quality at all levels, but also to the latest state-of-the-art technology that is used. 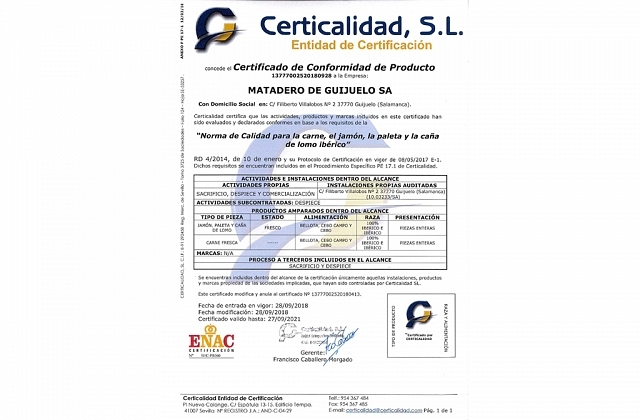 MAGUISA has certificate ISO 9001: 2008 and we work to obtain the BRC and IFS food safety certifications. It is authorized to export to Argentina, Brazil, Bosnia and Herzegovina, Canada, Colombia, South Korea, Costa Rica, Morocco, Cuba, Japan, Hong Kong, the Philippines, Ghana, Mauritius, New Zealand, Namibia, Lebanon, Macedonia, Mongolia, Montenegro, New Caledonia, Serbia, Peru, Thailand, Turkey, Ukraine, Uruguay, Mexico, Vietnam and the Dominican Republic.